Enjoy this guest blog post from Positive Health Wellness, taking a comprehensive look at oil cleansing method for acne! I always love sharing when I find a great new recipe and this one ROCKS! I’ve made it several times and improved upon the original in terms of satiety and flavor. The original recipe can be found here. If you do well with more carbs and less fat & protein, you’ll prefer the original recipe. I know that for myself and many of my health coaching clients, the opposite is true. In fact, the first time I made this recipe, I was still really hungry afterward. Once I modified it, I found it totally satisfying. Chop bacon up into inch long pieces and spread onto baking tray. Bake until done, about 40 mins at 350, stirring occasionally so all pieces get cooked. Cook until brown but not crispy. Add sliced onions and mushrooms on top for last 10 minutes. Slice up onion and mince garlic and set aside. Spiral slice sweet potatoes (I’ve used this spiral slicer for about 5 years). 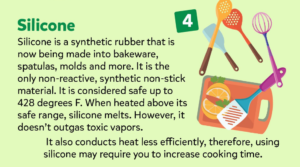 Put sweet potato noodles into a large pot and cover with water. Bring to a boil and cook for 10-15 minutes until just tender (or al dente if you prefer but do not overcook or they’ll get mushy and fall apart). While cooking, beat eggs in a bowl, add spices, garlic, and cheese. Take 1/4 cup of the cooking water and add to egg mixture. 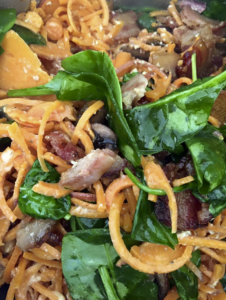 Drain the sweet potato noodles and add back to pot, stir in egg mixture thoroughly. Add in bacon, mushrooms and onions from oven and mix completely with either some bacon fat or olive oil. Turn heat on low and mix in raw spinach. Turn off heat once the spinach is wilted. Serve with some fresh pepper and Parmesan on top. 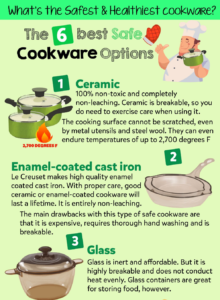 • The material of which the cookware is made should be non-toxic. 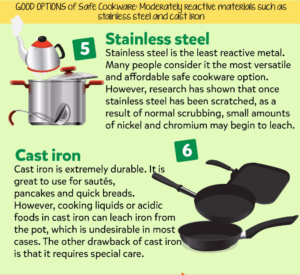 • The material of the cookware item should not leach. are harmful to the pets too. 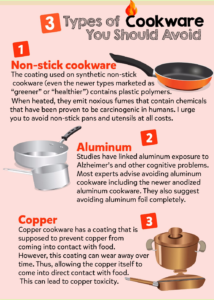 2) Aluminum Cookware: Aluminum is seen to have links with Alzheimer’s disease. leaching into the food. This can lead to copper toxicity.